The B47 was not an easy airplane to upgrade in, because of the tandem seating of the pilot and co-pilot, and because of the bicycle type landing gear. The initial landing gear had a stiff forward strut, so that touchdown on the forward gear started a bouncing sequence that could be catastrophic. Attempts to smooth out the bounce with the control column only seemed to lead to a worse condition with pilot inducing a worse second bounce and so on until the pilot finally gave up and applied power to go around. Unfortunately this led to another complication. The power did not come up when the pilot pushed the throttles forward. There was an 8 to 10 second delay, so the power might arrive at just the wrong moment when the nose was pointed toward the ground. This really made a hard bounce. I rode through a couple of these galloping gertie landings as co-pilot and they were frightening. I also watched one during which the airplane bounced so hard a couple of engines fell off the wing and the airplane ground looped. It ended up in a heap 180 degrees from its original direction. The tandem seating of the B47 made visibility bad in the back seat. This is where the co-pilot sat, or in case of a training flight, where the instructor pilot sat. Another complication was the low drag of the airplane in the landing configuration. The landing approach had to be made close to the stall speed; about l0 knots faster than initial buffet. A slower speed meant falling short, and a faster speed set the pilot up for landing too far down the runway or the good possibility of a bouncing galloping - gertie landing. Landings from the rear seat were extremely difficult because of the bad visibility. Most pilots did not feel like placing a novice in the front seat and risking disaster. A co-pilot felt real elated when a senior pilot elected to give him a front seat ride. My check ride finally came after a few front seat rides. I was put up for a check ride with one of the Air Force pilots. By this time in the program they were giving the check rides. Initially of course the Boeing pilots checked out the Air Force pilots. The check ride was uneventful except for a misunderstanding. The check pilot asked for a manual reversion landing. That is, a landing without hydraulically boosted controls. I thought he meant full manual reversion, but he had meant ailerons only. He was surprised later when I told him what I had done. Because I had an engineering degree, I became an engineering test pilot after my check out. I was made project pilot on the first RB47 Airplane. This was the reconnaissance version of the B47. It had a longer nose and the bomb bay was fitted for cameras rather than bombs. One of the first jobs was to clear the airplane for high-speed low level flight. The B47 was restricted to 425 kts maximum indicated airspeed because of limited lateral control at higher speeds. It would fly faster; up to about 460 kts indicated, but at that speed it had no lateral control with ailerons. You could move the wheel but there was no response. Some pilots even reported the airplane banked a little in the opposite direction because of wing bending. One job we had to do was fly the RB47 at 1,000 ft for 30 minutes at 425 kts indicated airspeed. We went down to the Gulf of Mexico to do this to get out of air traffic. At the time it seemed very hazardous because of the chance of hitting a bird or airplane, and because of the doubtful ability to bail out in case of a collision. We were glad when the 30 minutes were up. The in flight refueling doors had to be cleared for operation at 425 kts. It took several flights to do this. They were larger than the doors on the bomber version and more muscle had to be added. Refueling was more difficult with the RB47 because the nose was longer. The refueling receptacle was further from the pilot and he couldn’t see the boom as well. We judged our refueling position a lot by the stripes on the boom. We could tell from the stripes whether we were too far aft or too close. The KC97 Tanker had director lights for this, but they were mostly after the fact. When you saw the aft light come on, you were most probably going to fall off the boom and disconnect. I had to check out the refueling day and night with the RB47. I had never refueled at night, so I went looking for some one to give me some dual instruction. I couldn’t find any one interested, so I just went out and tried it. It wasn’t bad. The tanker was lit up like a Christmas tree. It was easy to see and formate with. I had trouble with the director lights. There just weren’t enough of them. This was corrected on the first jet tanker, the KC135. It had good director lights. Night flying in the RB47 led to one problem for me. I landed short one night and almost broke the nose gear off. 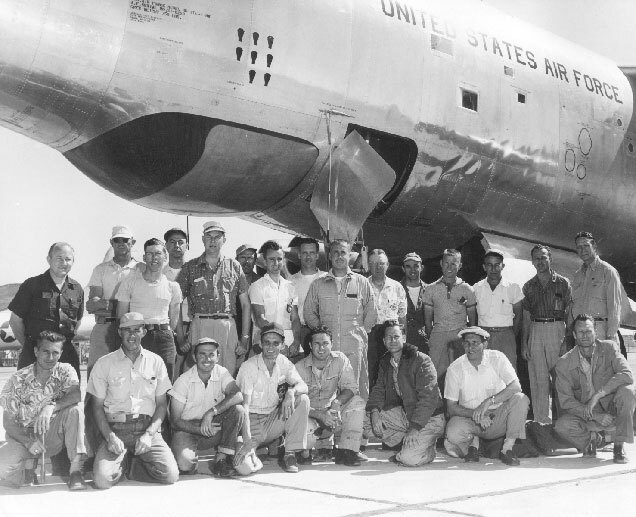 The B47 had a very shallow approach angle, probably 2 degrees versus a normal 3 degrees. This made height above the approach end of the runway difficult to judge. I was coming in one night, the air was smooth, and everything was looking great until there was a resounding crash and the airplane bounced high into the air. I was somewhat shocked and dazed. I couldn’t believe what had happened. I finally applied power, climbed up a couple of thousand feet and flew away from the airport while the navigator, Mr. Simons again, went back to look at the gear through a viewing port. He reported every thing looked normal so we went back and landed. The next day I was summoned out to look at the airplane. There were some wrinkles in the side of the airplane about 8 feet back of the nose. A large bolt in the drag link of the nose gear was bent and partly sheared. Just a little bit harder bounce and we would have been minus the nose gear. That probably would have ended my career as pilot at Boeing. I began to hate old 51-5258, the RB47 I had been flying. Every time I saw those wrinkles in the nose, it reminded me of my mistake. Actually my mistake wasn’t that big, it was the result that looked so bad. The day after the occurrence we went out and looked at the end of the runway and discovered I had hit the earth about 10 feet short. The thing that caused the most damage was a mound of dirt left by some ditch diggers who were burying a light cable across the end of the runway. A couple of years later an Air Force training pilot landed a thousand feet short of the end of the same runway resulting in the loss of the airplane. The approach to the runway was deceptive in that it was up hill. Also the first part of the runway was up hill. Several crashes occurred with the B47 because of the shallow approach angle. The shallow approach angle was necessitated by the low drag of the airplane in the landing configuration. Night approaches were particularly difficult. One airplane landing at night in England touched down a mile short of the end of the runway. Finally some one got the idea of the approach chute. This was a smaller chute than the landing brake-chute. It was deployed on the down wind leg before landing. It added drag, which allowed higher engine power and a steeper approach. The steeper approach gave the pilot a better view of the landing runway. When the approach-chute idea was conceived, Boeing received one for testing. I was co-pilot on the test flight. The test confirmed the value of the approach-chute. Toward the end of the testing the pilot inadvertently exceeded the maximum allowable speed with the chute deployed, and the link attaching the chute to the airplane failed. The chute fell in a field about 15 miles northeast of Wichita. Several days later I flew the Boeing PT-17 Trainer out to the area. I spotted the chute lying in a field, landed and picked it up. It was a fun thing to do, landing in a pasture, something you wouldn’t dare do now. The ecologists would get you or the farmer would sue for bent grass. Speed brakes were tried on the B47 for approach configuration drag. They worked, but I guess the cost of retrofit was too great and the Air Force decided not to buy the modification.